This programmable thermostat is suitable for use with hot air systems with no fan control and electric heating systems with relays. It is also suitable for use with line 120-240 volt pumps of water heating systems. You may program up to four settings per day, with each day being programmed differently if desired. 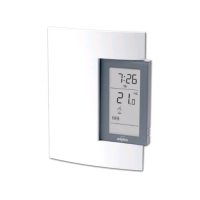 This thermostat has two operating modes, including automatic with temporary bypass and manual. It will retain the settings in memory even during a power outage, eliminating the need to re-program the thermostat. 5 amp resistive load at 30 volts. 2 amp inductive load at 30 volts. Suitable for 2 or 3 wire applications. 3.8" (97 mm) wide x 4.9" (125.5 mm) high x 1.0" (26 mm) deep.